After debuting at last year’s SXSW Film Festival, Dan Lindsay and T.J. Martin’s football documentary “Undefeated” was picked up by The Weinstein Company. 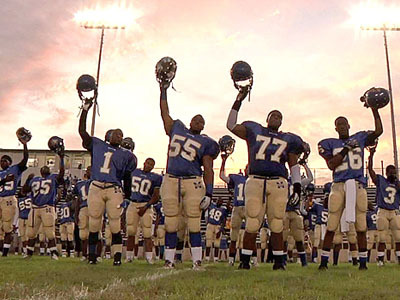 The film follows a high school football team in Memphis, Tennessee as they attempt to turn around a decades-long losing streak. Lindsay and Martin frame the story around the team’s coach, Bill Courtney, and three of the team’s players: promising left tackle “O.C.,” honors student lineman “Money” and hot-tempered linebacker Chavis. The film was recently nominated for an Academy Award for Best Documentary Feature and will be opening in theaters Friday, February 17. Directors Dan Lindsay and T.J. Martin sat down with Indiewire to discuss their nomination, how they became involved with the project, working with producer Seth Gordon and the difficulties of shooting high school football games. How did you feel when you found out about your Oscar nomination? Where did you find out about it? T.J.: I still don’t know how I feel. I still can’t comprehend that it’s actually happening. Dan: I was, I mean, totally cliché answer, but I was asleep. Dan: I just feel like there’s a lot of people who are awake but pretending. As if you don’t know that’s going to happen? But I just didn’t think there was any chance we were going to get nominated so I went out the night before, had a few drinks so I wouldn’t be thinking about it. And was just totally dead asleep. Our publicist woke us up. So you got a phone call? T.J.: Yeah, with the publicist screaming on the other end. T.J.: Yeah, I think we had champagne for breakfast that morning. Originally, your producer read an article about O.C. and that was how you got involved with the Manassas Tigers in the first place, but what was it about the Manassas Tigers that drew you to making a documentary about them instead of just O.C.? Why did you think this was worth filming? Dan: Part of it was meeting Bill. He was just such a dynamic character. It also just set itself up for a good narrative. Having a season, we knew there would be a beginning, a middle and an end. And because of the past failures that they’d had and they were starting to get better. It just felt that all of the elements were right for what we wanted to do. We wanted to make an experiential documentary. We didn’t want to make something where there’d be anecdotes, talking heads about past events. We wanted things to unfold in front of the camera. It just felt like that was going to give us the better opportunity. And we met Money on our first trip. Even when we read the article we thought this could be a potentially interesting film. Even before we met him, we thought what would be really nice would be to be able to juxtapose against O.C. Like who is the kid in the school who is trying his hardest but doesn’t have the athletic skill? When we met Money we were like, “Oh he can be that guy.” So I think in some ways it kind of would have ended up like that anyway. T.J.: For me I think the approach never really changed even when we found O.C.’s story. We wanted to make an experiential film that was more intimate. Still shot in a direct cinema, cinema verite kind of style. But I think once we met Bill and heard anecdotes of season past, we saw the potential for it to be less of a… I feel that if O.C. was the lead character then it would been something a little bit more understated. I thinking hearing anecdotes about seasons past and meeting some of the other characters, I think we saw something to have a much greater narrative scope and saw the potential for there to be much greater emotional swells. We got really luck that we got that. I’m trying to avoid the term “epic” but I think we saw the potential for it to be much greater. Dan: What kind of sold the investors was the world. We were really interested in the education of it and thought we would have more of that. We were kind of resisting and fighting making a sports film. We didn’t really want to do that. Cause it felt like this has been done before. People have followed football. It just felt like a traveled path. But as things were happening, we couldn’t deny the fact that all of the dramatic stuff was happening around the football field. So after a few weeks, we knew this was the story. It was telling us that this was the story. T.J.: We resisted making a sports film, then we dove headfirst and said if we’re going to be making a sports film it’s going to be the best damn sports film. Then through that process you should come out of the film realizing the sport has nothing to do with it. I mean, you could replace football with chess or painting in terms of the themes that are explored. Speaking of filming football, had you had any experience filming football before or did you have any specific inspirations for how you wanted to film it? How’d you approach filming the football scenes? Dan: It’s extremely difficult to film football. There was a steep learning curve on the first game. You watch football [on TV] and they’ll follow the ball in the air and you think “Aw, this won’t be a problem… Where’s the ball?” It’s really really hard. Having watched football and seen some films about football, we felt it was oftentimes shot from the stands down. And high school football is not terribly exciting. And we thought, “How do we make it exciting?” Who it is really exciting and intense for is the people on the team an on the sidelines. So we’re like, we’ll put ourselves and film the players and shoot over the shoulder perspectives of the players and the coach and hopefully we’ll be able to get that energy that you feel on the sidelines. It was more about how do we get that intensity via the camera so it’s not observational. I’d never seen “Friday Night Lights” before and about halfway through [filming] I started watching some of it on Netflix and we were like, oh [our style] is similar to what they did! T.J.: Halfway through the season we started watching “Friday Night Lights.” That did give us some ideas in terms of… just a cleaning up for our film. I watch the film now and I can see it from the first game to the last game it’s just like night and day. Dan: We hide some mistakes in some editing with our first couple of football games. T.J.: But the way the games are shot are basically just a reflection of the way we shot life off the field. It was just us as the production. The three of us were on the ground and shooting and doing sound and everything. Literally this was the team for nine months. We wanted to embed ourselves in the team and get something intimate for life off the field. So for the games we wanted to have a reflection of that. Have something really intimate with a lot of close-ups off the field and then all of a sudden you’re very distant when your main characters play. Once we came up with the approach of how we were going to shoot the film as a whole, it kind of told us how we should shoot the games themselves. Because we had such a small team, a lot of the emotion was going to be in the face so we ended up shooting a lot in the long end of the lens and we just sort of translated onto the field. It also lent itself to a lot of wipes and made it a little bit more dramatic. You said Money was a good counterpart to O.C., and of course, there’s also Chavis as well. Why did you decide to focus on those three? Were there any other students you found who might be worth following? Dan: There was one other player that we actually followed through the whole thing and when we got back to L.A. to start editing, he was in the first six-hour rough cut of the film. But his storyline was somewhat similar to O.C.’s and more than anything he didn’t interact with the rest of the guys as much. Every time we went to his storyline in the edit, it felt like you were veering off to this little vignette and then coming back to this thing that was driving forward. And there were two or three others, a coach we followed a lot, a couple other players but it was pretty clear that Chavis, Money and O.C. were going to be the characters right from the beginning. And it was about halfway through the season, I think Rich [Middlemas] was the first one who said, “Do you guys think you might want to interview the quarterback and the running back because they’re scoring all of the touchdowns?” We’re like, “Oh yeah, this is a sports film, people probably want to know about those guys!” And then we started looking at every other sports film and the leads are always the quarterback. But we were just interested in the human element and those guys had the most interesting stories so that’s what we followed. And we knew that the team was going to be a character as well. Those guys scoring the touchdowns represented the team, and if we could get you to root for the team, then you were rooting for those guys. That did run through my head as I was watching. Like, huh, this is different… The focus is usually on the quarterback but none of these guys are the quarterback. T.J.: But they don’t feel the need. It doesn’t pull them out of the experience. I read that you shot 500 hours of footage. Of that was there a lot that you wanted to put in and you couldn’t or did you find those two hours pretty easily? Dan: We didn’t find them easily! Well, I shouldn’t say that. We knew, obviously the moment of Bill hugging O.C. at the end and Chavis dedicating his award or Money getting hurt. A lot of these things were in no matter what. And it’s about building the narrative around those events. So we knew those bigger things but there’s definitely a lot of stuff that is not in there that we would love people to see. There’s maybe too many speeches by Bill in the film, but he’s got incredible other things that he said. T.J.: There’s also a lot of moments with the kids that are very indicative of where they’re at emotionally throughout the course of the season but we couldn’t quite squeeze them in. You find when you’re cutting you choose what’s best. You’ve got three or four moments and you must choose one of those three or four moments that best represents where the character is that at that time in that scene. T.J.: O.C.’s dad had a storyline. Dan: His dad is a security guard for an abandoned building. We were like how can you set up north Memphis better? Anytime we put him in the cut, it just obviously brings up so many questions, like why isn’t he in O.C.’s life as much? We ultimately had to take him out, because there was no way we could responsibly, in the time that we had, tell that kind of nuanced story. T.J.: I think there’s a version of this film that’s more understated, a little broader in scope. Coming to north Memphis, here are a series of vignettes to give you an idea of what life is like in north Memphis. We battled that for just a little bit. How did get involved with Seth Gordon? T.J.: Seth did not play professional football. Dan: Literally, without Seth on board I don’t think we would have got the financing the way that we did, the meetings that we did. Also Seth was so vitally important in coming in with fresh eyes to see the edit and be like, “You’re wasting too much time here” and he was removed enough from the process that he could give us good notes. There are a couple of little structural things in there that were all him. T.J.: He just pointed certain things out that opened up the world for us a little bit more. Dan: And Seth’s obviously moved on to big studio features, but his heart is in documentaries and he wants to help foster the talent in that world. He was absolutely vital to this. So my last question is what are you up to now? Do you have any other projects in works? Dan: Not getting much sleep. T.J.: We don’t have anything concrete. We’ve got a handful of stuff that we’ve been developing. We’re both looking at scripted narratives and the doc space. I think we always just say at the end of the day that the best story is going to win. We’re just been actively seeking what that next story is going to be. Dan: We’ve also made a commitment with Exclusive Media, the company that did our film, to do another film there. And whether that’s a documentary or scripted, we don’t know. Like T.J. says, it’s all about story for us. We find the right form is not as important as story. The story will tell us what it’s going to be. We don’t think of ourselves as exclusively documentary filmmakers although that’s where we got our start and it’s what we love and we’ll never not make them. But short answer, if you have a job for us, that would be fantastic!